Fletcher works with a diversity of bird species throughout the western hemisphere following migrants from their breeding to winter grounds. 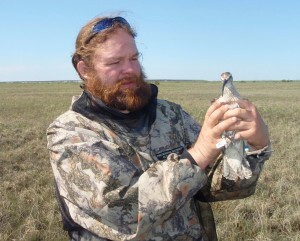 His current research projects include work with Whimbrels, Red Knots, Marsh Sparrows, and neo-tropical migrants. In addition, he also conducts breeding bird surveys, manages the Saw-whet Owl banding program, and is the Center’s primary rocket netter. Smith, F. M., B. D. Watts, and B. J. Paxton. 2017. Frequency and Distribution of Birds within Forested Wetlands – Breeding and Wintering Seasons. The Center for Conservation Biology Technical Report Series, CCBTR-17-07. College of William and Mary & Virginia Commonwealth University, Williamsburg, VA. 18 pp. Watts, B. D., B. J. Paxton and F. M. Smith. 2017. Assessment of black rail status in North Carolina, Interim report: Spring 2017. Center for Biology Technical Report Series, CCBTR-17-05. College of William and Mary and Virginia Commonwealth University. Williamsburg, VA. 9 pp. Smith, F. M., B. D. Watts, J. E. Lyons, T. S. Keyes, and B. Winn. 2017. Investigating red knot migration ecology along the Georgia coast: fall 2015 and spring 2013, 2015-16 season summaries. Center for Conservation Biology Technical Report Series: CCBTR-17-04. College of William and Mary/Virginia Commonwealth University, Williamsburg, VA. 93 pp. Watts, B. D., M. D. Wilson, C. J. Lotts, F. M. Smith, and B. J. Paxton. 2017. Investigation of Red-cockaded Woodpeckers in Virginia: 2017 report. The Center for Conservation Biology Technical Report Series: ccbtr-17-02. College of William & Mary and Virginia Commonwealth University, Williamsburg, VA. 16 pp. Watts, B. D., F. M. Smith, and B. R. Truitt. 2017. Departure patterns of Whimbrels using a terminal spring staging area. Wader Study 124:141-146. Paxton, B. J., B. D. Watts, and F. M. Smith. 2016. An assessment of the Bald Eagle and Great Blue Heron breeding populations along High Rock, Tuckertown, Narrows, and Falls Reservoirs in central North Carolina: 2015 breeding season. The Center for Conservation Biology Technical Report Series, CCBTR-16-04. College of William and Mary & Virginia Commonwealth University, Williamsburg, VA. 44 pp. Watts, B. D., M. D. Wilson, C. Lotts, F. M. Smith, and B. J. Paxton. 2016. Investigation of Red-cockaded Woodpeckers in Virginia: Year 2015 report. Center for Conservation Biology Technical Report Series, CCBTR-16-03. College of William and Mary and Virginia Commonwealth University, Williamsburg, VA. 26 pp. Bulla, M. et al. 2016. Unexpected diversity in socially synchronized rhythms of shorebirds. Nature. Advance online publication: 2016/11/23. 1476-4687. Anderson, C. M., F. M. Smith, and P. F. Woodward. 2016. An Interspecific Mixed Clutch of Semipalmated Sandpiper and Lapland Longspur Eggs. Waterbirds 39:323-326. Wilson, M. D., F. M. Smith, and B. D. Watts. 2015. Re-Survey and Population Status Update of the Black Rail in Virginia. The Center for Conservation Biology Technical Report Series: CCBTR-15-04. College of William and Mary & Virginia Commonwealth University, Williamsburg, VA. 14 pp. Watts, B. D., B. J. Paxton, and F.M. Smith. 2015. Shorebird banding and training within the Upper Bay of Panama Western Hemisphere Shorebird Reserve. Center for Conservation Biology Technical Report Series, CCBTR-15-03. College of William and Mary/Virginia Commonwealth University, Williamsburg, VA. 12 pp. Smith, F. M. and B. D. Watts. 2015. Surveys and Habitat Use of the Whimbrel (Numenius phaeopus) During Fall Migration Along the Acadian Peninsula of New Brunswick, Canada, 2014. Center for Conservation Biology Technical Report Series CCBTR-15-02. College of William and Mary/Virginia Commonwealth University, Williamsburg, VA. 21 pp. Watts, B. D., F. M. Smith, C. Poli, N. Banfield, and T. Jones. 2015. Bell’s Vireo captured on lower Delmarva Peninsula. The Raven 86:11-12. Watts, B. D. and F. M. Smith. 2015. Winter composition of Nelson’s and saltmarsh sparrows in coastal Virginia. The Wilson Journal of Ornithology 127: 387-394. Watts, B. D., B. J. Paxton, and Fletcher M. Smith. 2014. Shorebird banding and training within the Upper Bay of Panama Western Hemisphere Shorebird Reserve – Interim Report. Center for Conservation Biology Technical Report Series, CCBTR-14-18. College of William and Mary/Virginia Commonwealth University, Williamsburg, VA. 20 pp. Paxton, B. J., B. D. Watts, and F. M. Smith. 2014. An assessment of the Bald Eagle and Great Blue Heron breeding populations along High Rock, Tuckertown, Narrows, and Falls Reservoirs in central North Carolina: 2014 breeding season. Center for Conservation Biology Technical Report Series, CCBTR-14-16. College of William and Mary/Virginia Commonwealth University, Williamsburg, VA. 47 pp. Smith, F.M., and B.D. Watts. 2014. An Investigation of Whimbrel Stopover and Migration Ecology on the Eastern Shore of Virginia. Center for Conservation Biology Technical Report Series, CCBTR-14-12. College of William and Mary & Virginia Commonwealth University, Williamsburg, VA. 12 pp. Smith, F. M., M. D. Wilson, and B. D. Watts. 2014. Population Estimation and Spatial Distribution of the Wintering Marsh Sparrow Guild in Virginia. The Center for Conservation Biology Technical Report Series: ccbtr-14-07. College of William and Mary and Virginia Commonwealth University. Williamsburg, VA. 12 pp. Watts, B. D., B. J. Paxton, and Fletcher M. Smith. 2014. Shorebird banding and training within the Upper Bay of Panama Western Hemisphere Shorebird Reserve – Interim Report. Center for Conservation Biology Technical Report Series, CCBTR-14-05. College of William and Mary/Virginia Commonwealth University, Williamsburg, VA. 20 pp. M. Smith, B. D. Watts, J. E. Lyons, and T. S. Keyes. 2014. Investigating Population Dynamics of Red Knot Migration along the Georgia Coast through Mark/Recapture Analysis of Resights. Center for Conservation Biology Technical Report Series, CCBTR-14-04. College of William and Mary/Virginia Commonwealth University, Williamsburg, VA. 40 pp. Wilson, M. D., B. D. Watts, C. Lotts, F. M. Smith, and B. J. Paxton, 2014. Investigation of Red-cockaded Woodpeckers in Virginia: Year 2013 report. Center for Conservation Biology Technical Report Series, CCBTR-14-02. College of William and Mary and Virginia Commonwealth University, Williamsburg, VA. 17 pp. Watts, B. D., F.M. Smith, and B.J. Paxton. 2013. An assessment of the Bald Eagle and Great Blue Heron breeding populations along High Rock, Tuckertown, Narrows, and Falls Reservoirs in central North Carolina: 2013 breeding season. Center for Conservation Biology Technical Report Series, CCBTR-13-06. College of William and Mary/Virginia Commonwealth University, Williamsburg, VA. 46 pp. Wilson, M. D., B. D. Watts, C. Lotts, F. M. Smith, and B. J. Paxton. 2012. Investigation of Red-cockaded Woodpeckers in Virginia: Year 2012 report. CCBTR-13-01. Center for Conservation Biology Technical Report Series. College of William and Mary and Virginia Commonwealth University, Williamsburg, VA. 31 pp. Keyes, T., F. Smith, and B. Winn. 2013. The Shorebird Migration Puzzle. The Center for Conservation Biology Educational Document: ccbed-13-01. College of William and Mary & Virginia Commonwealth University, Williamsburg, VA. 2 pp. Denmon, P., B. D. Watts, and F. M. Smith. 2013. Investigating American Oystercatcher (Haematopus palliatus) nest failure on Fisherman Island National Wildlife Refuge, Virginia, USA. Waterbirds 36: 156-165.